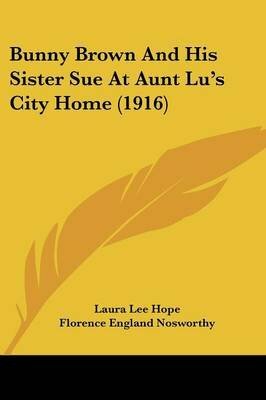 Laura Lee Hope is a pseudonym used by the Stratemeyer Syndicate for several series including the Bobbsey Twins, The Moving Picture Girls, Nancy Drew Mysteries and Six Little Bunkers. Bunny Brown and His Sister Sue Keeping Store, published in 1922, is the 12th book in the Bunny Brown and His Sister Sue series. Other books for children about this delightful bunny and his sister include: Bunny Brown and His Sister Sue, Bunny Brown and His Sister Sue on Grandpa's Farm, Bunny Brown and His Sister Sue Playing Circus, Bunny Brown and His Sister Sue At Aunt Lu's City Home, Bunny Brown and His Sister Sue at Camp Rest-a-While, Bunny Brown and His Sister Sue, in the Big Woods, and Bunny Brown and His Sister Sue on an Auto Tour.